A mother who lost her two-year-old daughter to a rare cancer is warning parents to keep fighting if they feel their concerns are not taken seriously. Kelly Clarkson said she has to live with the guilt for the rest of her life that she did not push harder for Megan. The child was seen by six doctors and five nurses over a 28-month period before her lung cancer was diagnosed. She was told "some children just cough" after repeatedly returning to her GP. Megan died less than four weeks later. Mrs Clarkson, from Kirkcaldy, believes there needs to be a culture change where the most common illness must not be assumed and more serious issues should be considered. She thinks a mother or father's instinct should not be ignored. Megan developed a persistent cough after starting nursery aged six months. Kelly took her to the GP in November 2016 after it failed to improve and she had lost weight through being sick. For four months she was repeatedly told it was an upper respiratory tract infection and that "some kids cough". Mrs Clarkson stopped going back to the GP and treated Megan at home, feeling that constantly returning to the doctor made her feel like a burden. She told the BBC Scotland news website: "I feel when she was not well at 10 months old I stopped taking her to the GP because I couldn't keep saying 'she coughs'. "Me and my husband tried everything - she coughed more when she had orange juice, so we didn't give her orange juice. "We tried an antihistamine at night because maybe she had hayfever. "I dusted her room like a demon to make sure it wasn't that. "I made sure the vents of her window were always open so she had adequate air. "I just didn't feel it was anything that the doctor would consider an issue, because she recovered from each episode enough to think she was better. But she never stopped coughing." By November 2018, Megan was complaining of pain under her arm and bruising. After Mrs Clarkson told a nurse practitioner Megan was suffering from a chesty cough and was choking during the night, she was given antibiotics she couldn't swallow. After that she was prescribed inhalers and her mum was told it may be asthma. 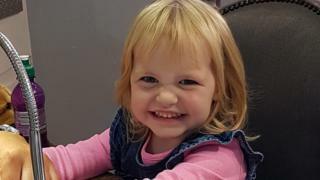 In December 2018, Megan was taken to the Royal Hospital for Sick Children in Edinburgh where Mrs Clarkson says she had to "get nasty" and insist on seeing a doctor and not a nurse practitioner. After an X-Ray, Megan was diagnosed with type three Pleuropulmonary Blastoma - a rare and aggressive lung cancer found in children. She was gravely ill. Two-year-old Megan needed surgery to remove a tumour. Megan went into theatre on New Year's Day and had her whole right lung removed. But she suffered a significant bleed and a cardiac arrest. Mrs Clarkson said: "It was too much. She died after the operation on 2 January - it was just too much for her wee body." Despite the tragedy, Mrs Clarkson refuses to blame anyone. She said: "No-one has done Megan any harm on purpose and I don't blame anyone. "But I think there is something wrong in the system that needs reviewed. "When I came back to the doctor again and again as a parent saying it was getting worse, I felt like I was being a burden. "I will hang onto those memories of how I was made to feel forever. And I don't want any other parent to feel like that." Mrs Clarkson believes that if Megan's cancer had been detected when she had first presented at 10 months old, she would have had a 90% chance of survival. On diagnosis, her odds were reduced to 37%. She said; "I could accept that if we had done something then. But she was a 10-month-old baby losing weight. And I think why wasn't anything done?" Now, she wants to campaign for change, so that parents will feel supported if they return to the doctor with a genuine concern. She wants a change in attitude, where the rare and the serious is not discounted at the beginning. Mrs Clarkson said: "You are left with stories of mothers having to stage a sit-in until they get an X-ray. "And I am left with that guilt for the rest of my life. It's an irrational guilt, but I will carry it forever that I didn't push harder for Megan. "In a system where I shouldn't have to push. Megan should have been pulled through that system, because she was not well." NHS Fife medical director Dr Frances Elliot said: "The death of any child is a tragedy and our thoughts and condolences are with the family at this very difficult time. "NHS Fife has not received any direct communication from the family, however we would extend an offer to meet with the family to discuss the concerns they have raised."